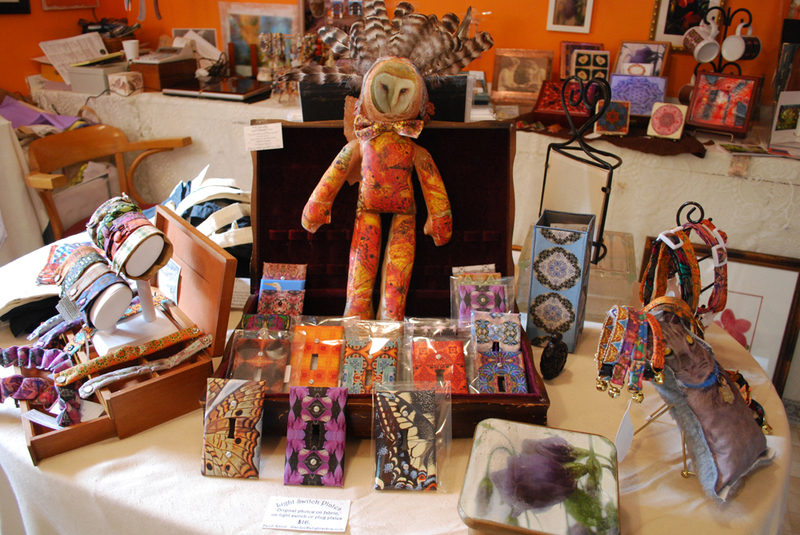 Garden Delights Arts and Crafts Open Studio! 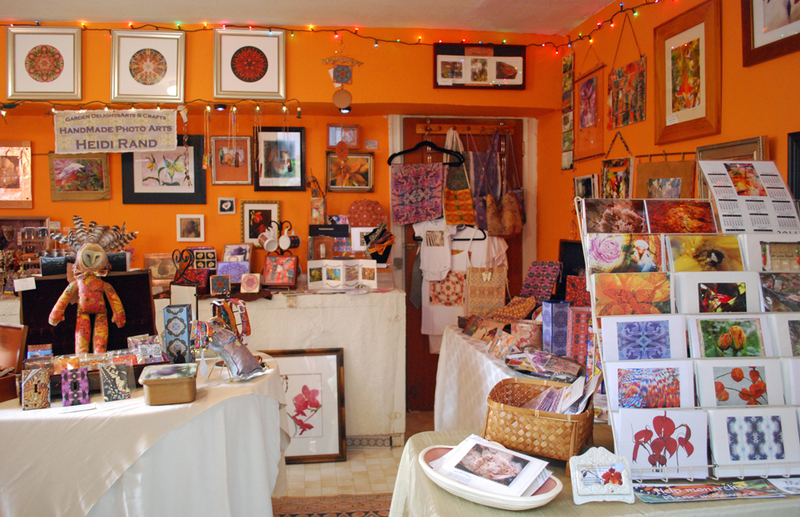 I’ve been happily scrambling to get my messy workroom presentable for my holiday Open Studio and Gift Sale. And amazingly, it was pretty much all in place by the time the first visitor showed up! My friend Pam always comes on my first day, and gets her pick of the calendars that I print using my images. She took most of the calendars I had made, I’ll need to do some printing tonight. There was a lull after she left, so I kept busy taking photographs of the spruced-up studio. The top shelf has a night light, a transparency print in a frame and one of my fabric vases. The second shelf down has a display of ornaments, including glass balls with mandalas and other designs printed on backlight film or transparencies, along with a dusting of glitter, some mandala sachet ornaments with pearl hangers, and my stuffed animal ornaments – some with squeaky toys inside! 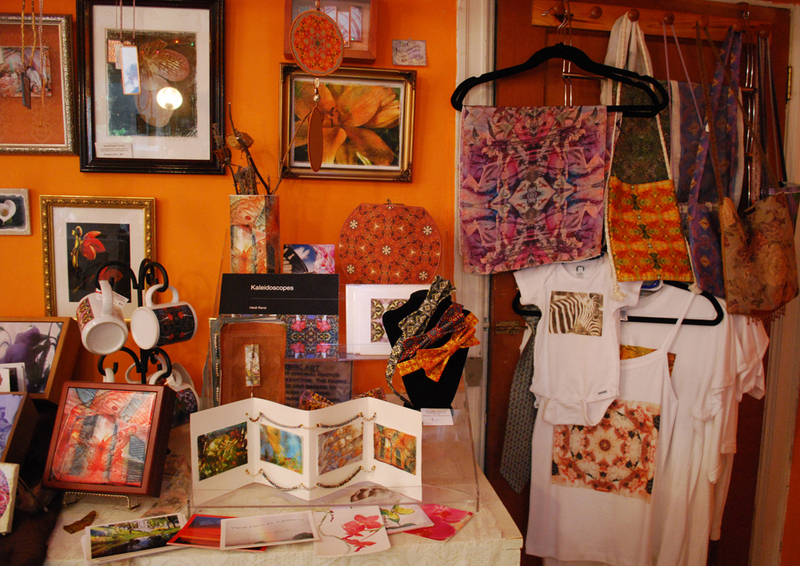 In the photo above you can see what’s past the center table along the back wall — a hanging display with several of my purses, t-shirts, scarves, and baby onesies. 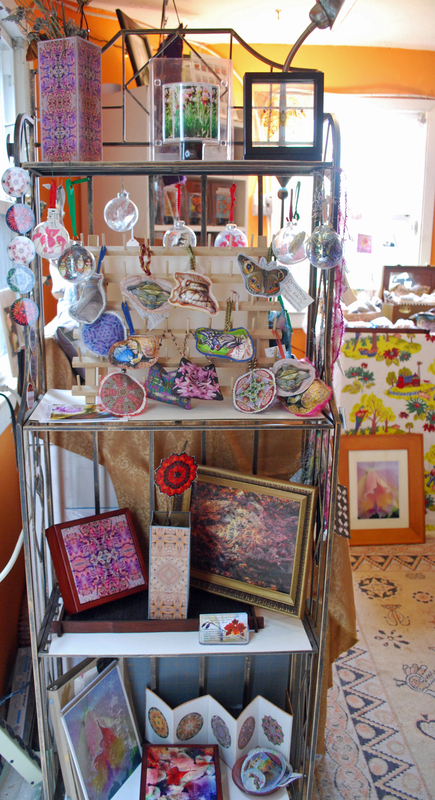 To the left, a rack with a fabric vase, my bowties, mixed-media handmade books, my Kaleidoscopes book, some coffee mugs I ordered from my Zazzle store, and a tile box. Above is a closeup of that rack. The piece at the bottom is an accordian of watercolor paper, with four of my abstract collages printed on lutradur and mounted. I strung pearls across the top and bottom. The bowties are jauntily hung just above that piece, on a jewelry bust. The table above is to the right just past the card rack. 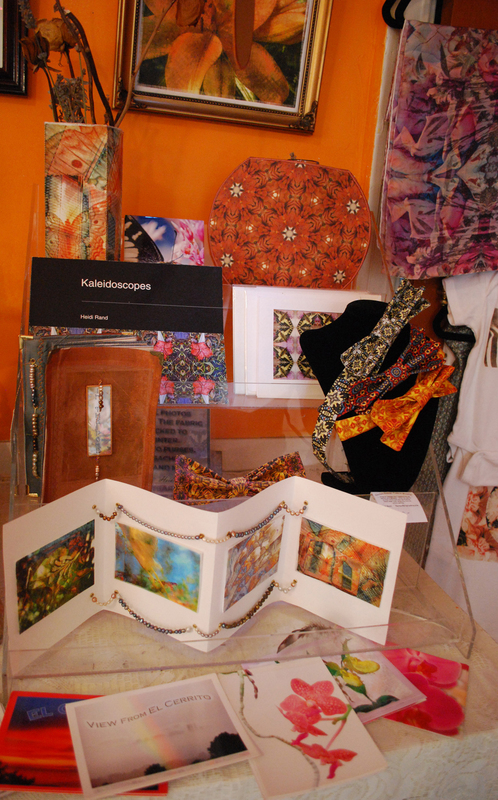 From left to right: purses, wooden postcards, fabric bowl, buttons, fabric vases, fabric postcards, and some night lights. I love to use vintage pieces as displays. On this table I’m using two old silverware boxes, sturdy wooden boxes lined with velvet. To the back wall again, above is a display of the different kinds of boxes that I make. First, the blue – I printed my mandala of a blue girl rose onto fabric, quilted it and placed it into the recessed top of a wooden box. The box to the left of that is one of my favorite tiles. It’s a kaleidoscope design in rich deep browns, very craftsman style. I make most of my own work, but some things I do have printed professionally. This is one of the tiles that I have Tony at Changeyourart make to use as the tops of wooden boxes that I get at Aftosa. The two small tiles in front of the blue girl rose box are ones that I made myself using lazertran on tumbled marble tile. It’s a hard technique to master, and I often end up scrapping my creations, but I love how these mandalas turned out. To the left of those tiles are some glass slide pins I made using my photos printed on velvet fine art paper or canvas, and encased in microscope slides that I outlined with copper tape. Behind the brown tile box are two more boxes I made using lazertran. 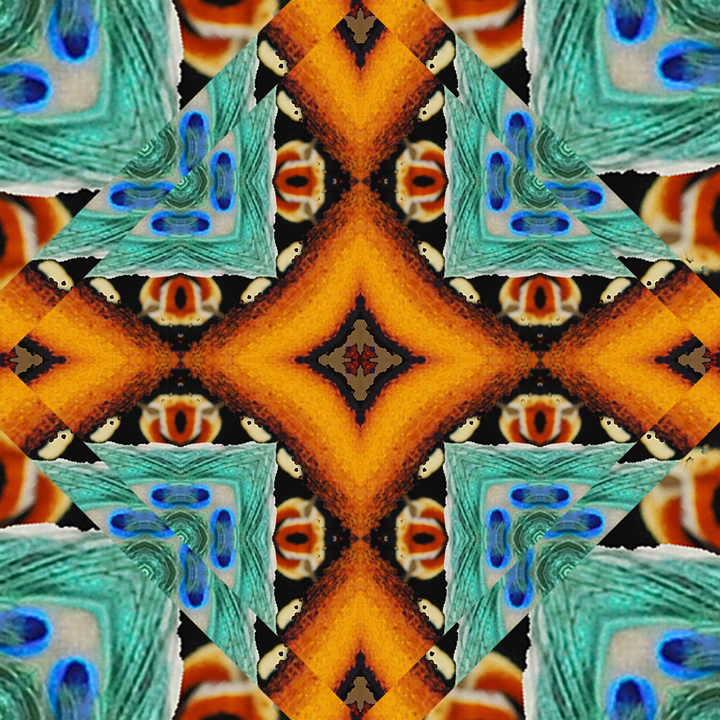 The front one is a kaleidoscoped photo of a calla lily, and behind that is my kaleidoscope design of a fern arching. For that box, I encased the top edges with copper metal. 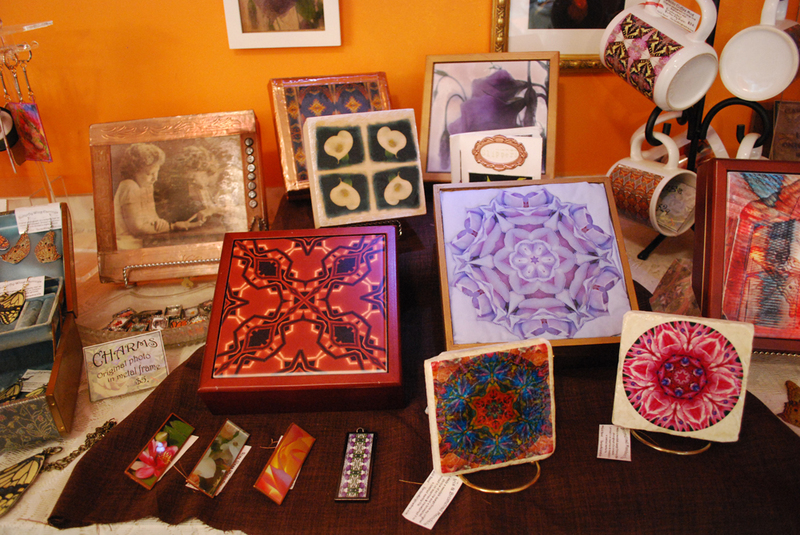 To the left is another tile box of my Lisianthus Flower design. Finally, the box at the far left is one of my favorite pieces. I used the double exposure photograph that I took of myself and adhered it to the box using a heat transfer. I embossed some copper and used the strips at the top and bottom edges. I also made a dangle from pearls and glass beads, and with metal brads on mesh spelled out “treasure”. Inside the box, I printed the same double exposure image onto silk and used batting to make it a soft pad on the inside top. Past the boxes is more jewelry. 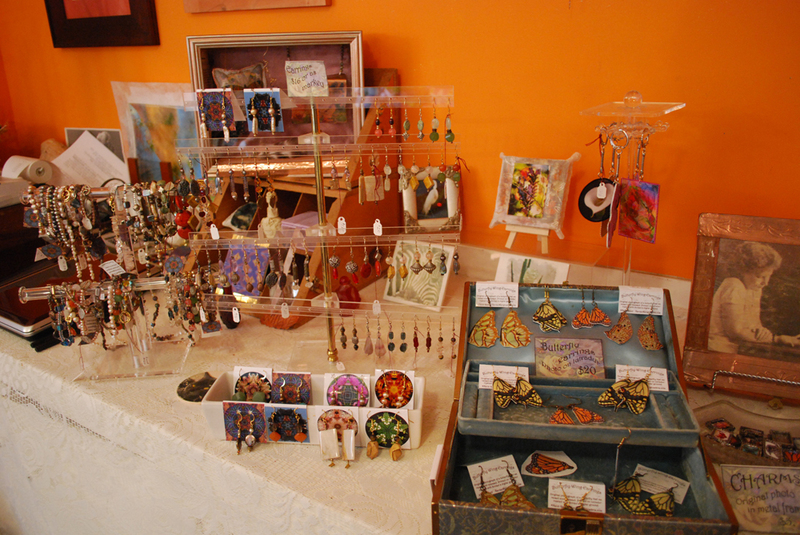 I have some hanging displays for earrings and bracelets. 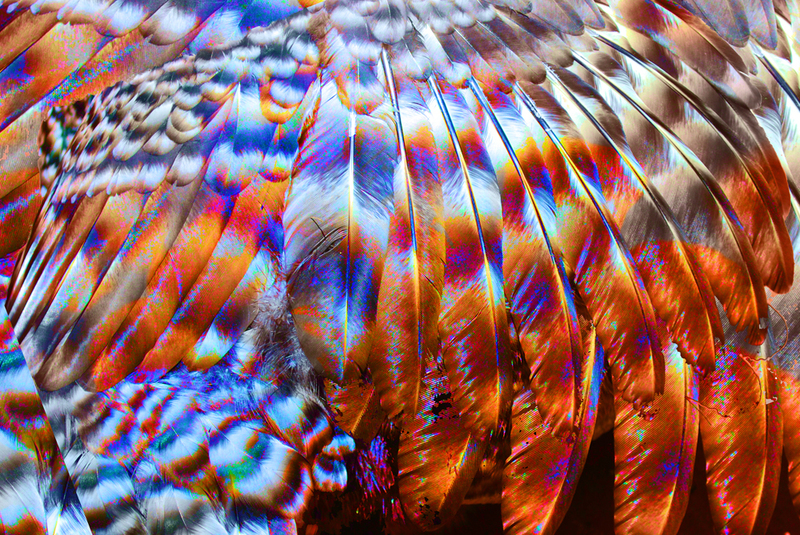 Before I began my photo arts work, I used to make jewelry from pearls and beads, and I still love to do that. 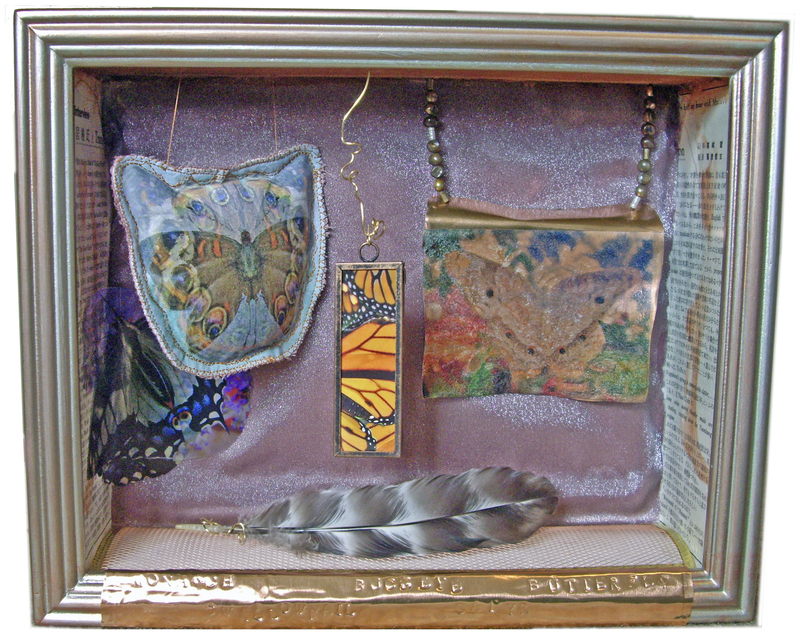 The vintage jewelry box at the front right holds my lutradur butterfly earrings. I take the photos of butterflies that my husband and I raise and release, and print my designs from the photos onto lutradur that I’ve coated with Digital Grounds. Next a view of the other side of the middle table. 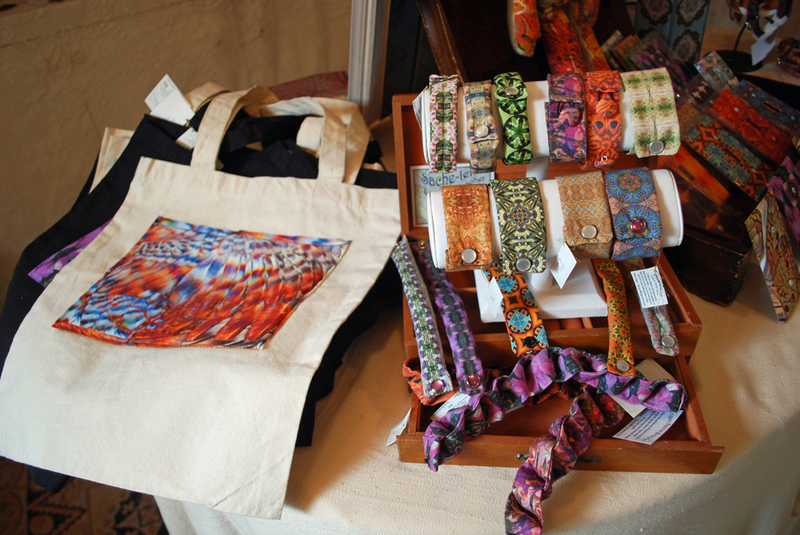 At left, a pile of my tote bags, which I make by printing my images onto fabric and sewing them onto the totes. I used to make them with iron-ons, but I much prefer the fabric. Most of them I back with batting and then do some free-motion quilting. 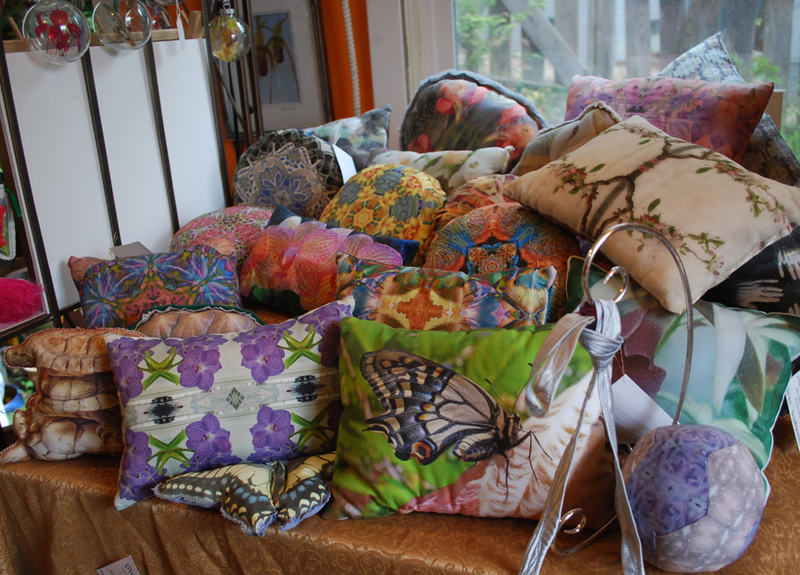 To the right is another vintage jewelry box that I’ve piled with my original design fabric jewelry. There are fabric bracelets with snaps and buttons, sachet-lets, and my sculptural braided fabric bracelets. 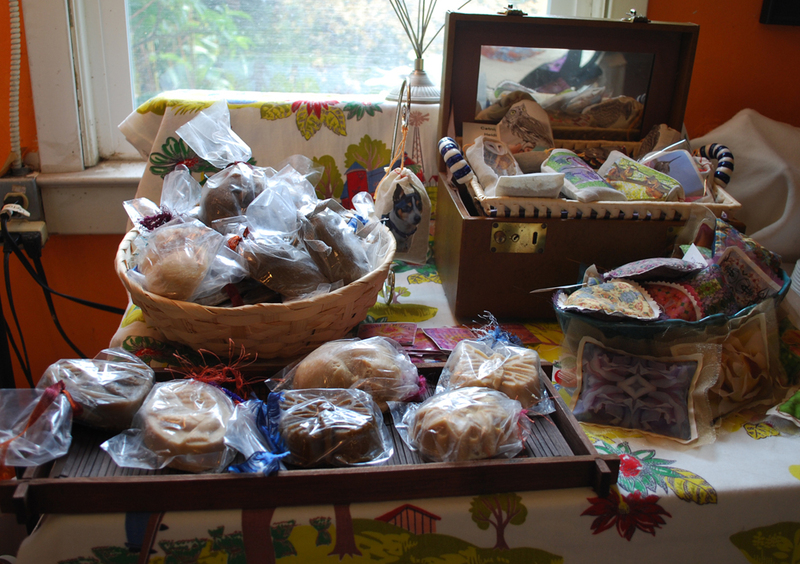 The soaps that my husband George makes are displayed in front and in the basket at the top left. He makes the most wonderful soap from natural ingredients using an assortment of molds. 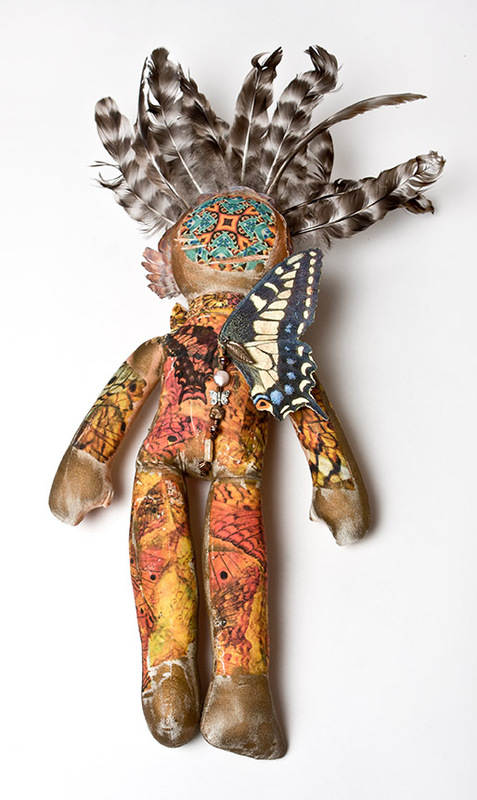 His most popular is the mold of a curled-up sleeping kitty, and close favorites are a butterfly and hummingbird. He makes a variety of soaps, both cold process and melted. To the right is a basket of sachets that I make from my fabric, which I fill with heavenly lavender flower buds (and some with rose buds). The backs of the sachets are gauze, so you can see the flowers. Behind the sachets is a basket with catnip bags. 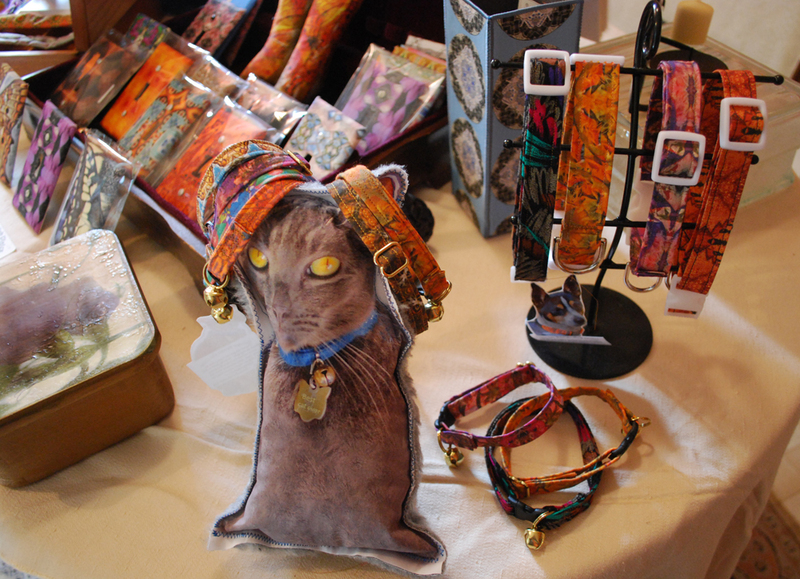 I use the strongest catnip I’ve found, Cosmic brand, and put various fun animals photos printed onto fabric on the front. When I do Open Studio the cats are forbidden from coming down here, because they’d make a beeline for the catnip bag display and wreck the merchandise (yes, I know this from experience). Tomorrow if I get a lull I’ll take you on a tour of the art that’s hanging on the walls … Come on by to see it yourself if you’re in the Bay Area! 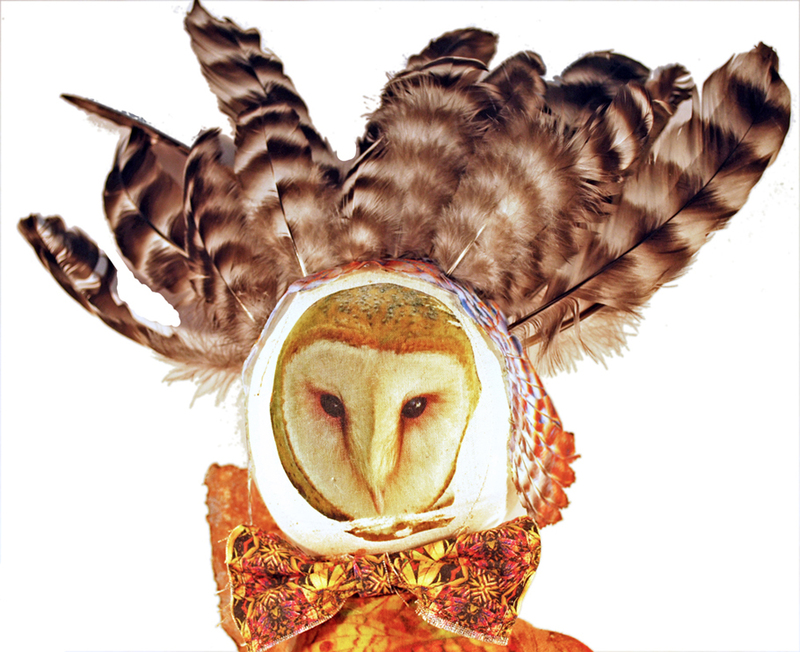 In this one-day workshop, you’ll learn to make creative and unique artwork by printing on surfaces other than paper. I’ll introduce you to several different products and techniques to print directly on fabric, vellum, transparency film, and more. 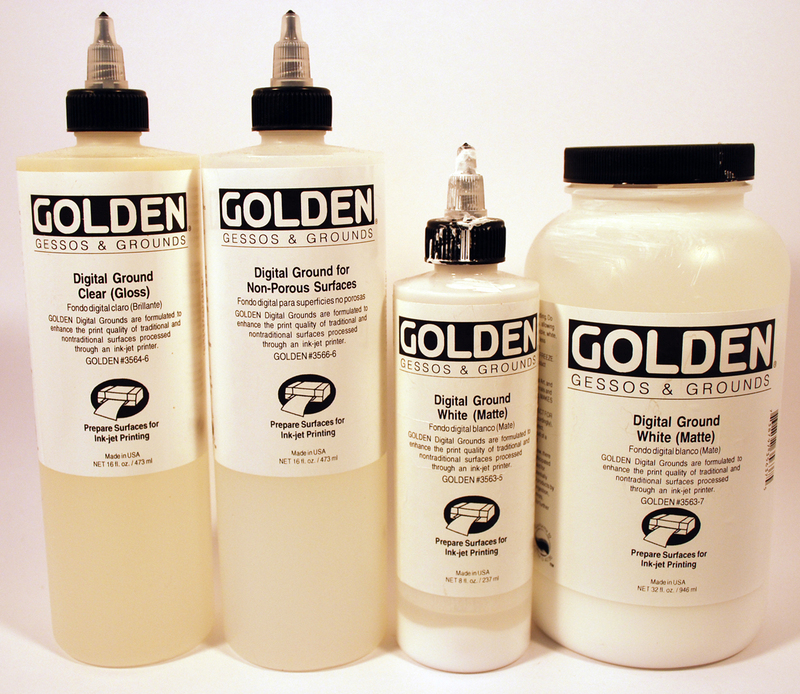 You will learn how to coat surfaces for inkjet printing with Golden Paint’s Digital Grounds and inkAID. We’ll also print directly on metal and wood veneer — since a printer with a straight path is required for these surfaces you may not be able to do this with your current home printer). We will complete at least one printing project per person at the workshop. Online art classes at CraftEdu — coming soon! I’m always amazed to find that even as I reach out over the internet to people all over the world in places I’ll never be lucky enough to visit .. that it really all comes down to personal relationships. 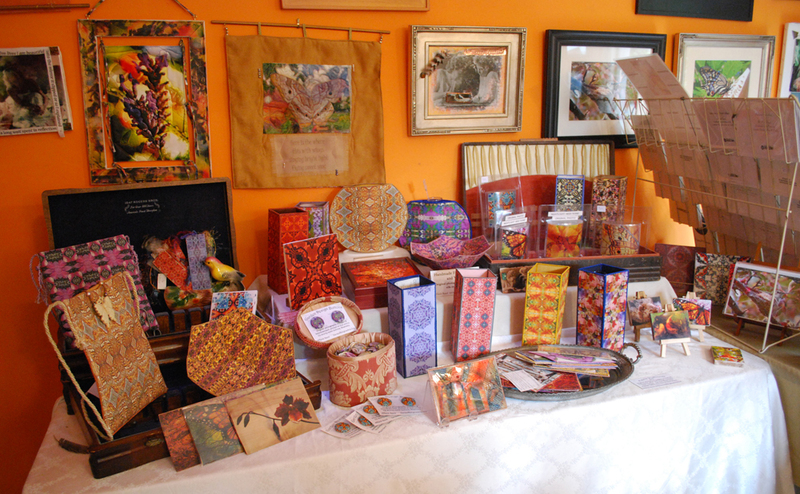 Grace Taormina, a talented mixed media, collage and fiber artist, and author of The Complete Guide to Rubber Stamping and The Complete Guide to Decorative Stamping is a wonderful friend I made through our local arts group, the Pinole Artisans. 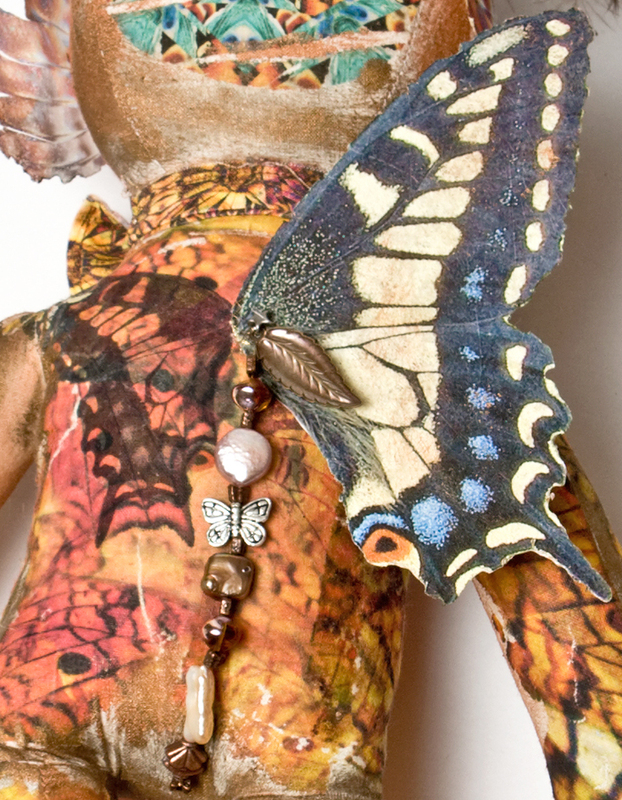 Now follow me here — Grace is friends with Donna Kato, an amazing polymer clay artist, author, teacher, and product developer. 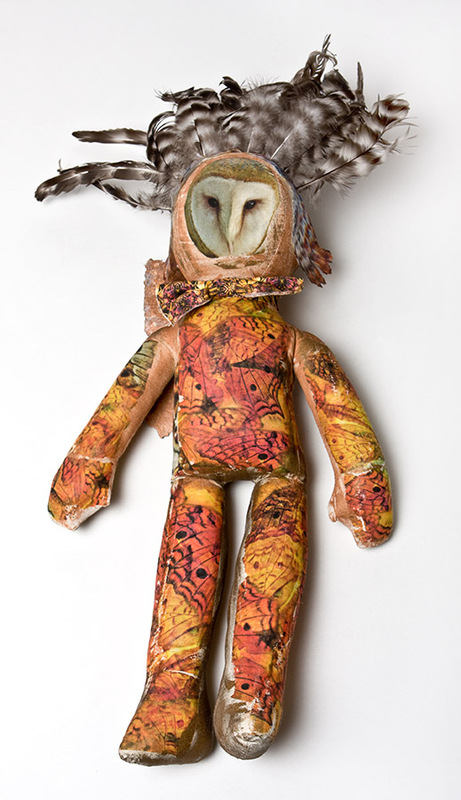 They met in the craft industry, and would catch up when they were both doing appearances on Carol Duvall’s TV shows. When Donna began dreaming of teaching online, rather than travelling the world and spending so much time in airports, one of the first people she contacted to take part was her friend “Gracie”. And I’m very honored that Grace recommended me to Donna. So, what’s it all about? Donna describes her dream, CraftEdu, as a creative powerhouse of talent covering many art and craft media. She selected the faculty based on expertise and ability to instruct and inspire their students, and boasts of a team of the best and the brightest the art and craft world have to offer. After much searching, Donna found the perfect platform to offer online classes. Created and designed by Faculte, it provides a unique alternative to conventional pdf based class presentations and creates a near in person teaching environment. CraftEdu will launch in beta in March 2010 and anticipates an official launch in April 2010. I’ll be teaching inkjet printing on fabric, using lutradur in your art and printing on lutradur, inkjet transfer techniques, and much more! My CraftEdu gallery is a short introduction to my artwork and the kinds of classes I will be offering. Follow the CraftEdu blog and learn more about faculty members and events at the CraftEdu facebook page! This is going to be a really fun workshop. I’ll show you how to make personalized gifts (for friends and family or for yourself!) 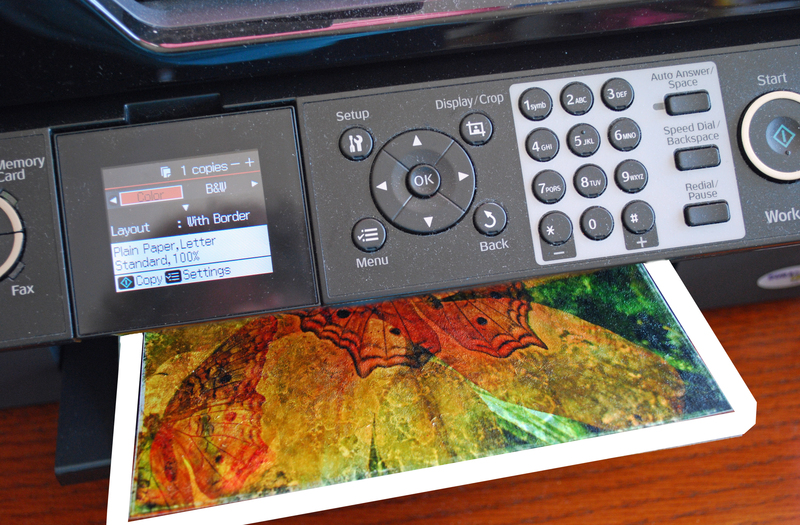 using your own photographs, designs, or other material and your home printer. We’ll explore a variety of different techniques to create unique gifts, like printing on fabric and other special surfaces ideal for making presents. Each person will complete at least one project at the workshop, and you’ll go home with many ideas and new things to try on your own printer. There’s plenty of time before the holidays to create gifts for everyone on your list! When you make a personalized gift you can save money and show that you care to take the time to create something special for your loved ones. You can use photographs and the originals or scanned memorabilia of things in your lives together for gifts that people will treasure and keep. The workshop will be Sunday November 15, 2009, noon to 3:30. Cost is $35 plus materials. It will be held at the Canyon Trail Art Center in El Cerrito California. Please pre-register by emailing me at heidirand@gmail.com, or you can pre-register at the El Cerrito Recreation Department, 7007 Moeser Lane El Cerrito, (510) 559-7000. If you want to see the gifts that I make from my photographs and designs, please visit my ETSY shop.